Life is a learning curve, and recruitment is no different. Whether you are looking for a job, or interviewing candidates to join your business, giving feedback and listening to feedback is a crucial part of the process. 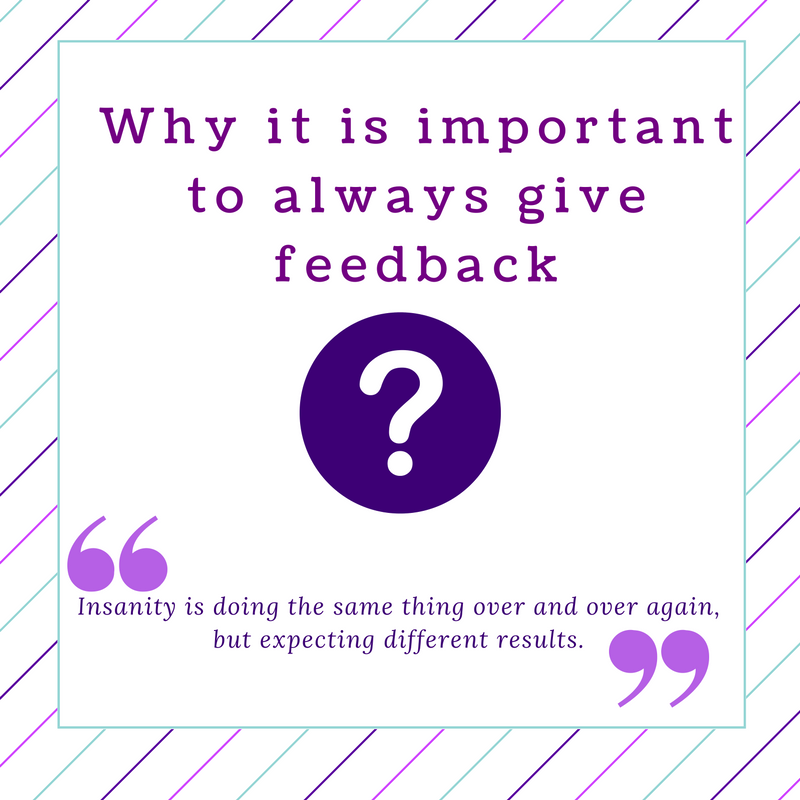 For without feedback – how can we learn? I have often called a client after they have held a day of interviewing, and they give detailed feedback on the candidates they want to progress to second stage, but briefly reject the others. I pride myself on not accepting this, and really delving into why some candidates were not successful, and looking at how they can improve. Because if I can’t give my candidates constructive feedback, how can they learn from their mistakes? For me, as an experienced recruiter – I am passionate about getting detailed feedback and passing on both the good and the bad. You can see this confirmed in the candidate promise on our website. As a recruiter, the most common complaint I hear from my candidates, is that they went for an interview and never heard back. It is a poor impression to leave someone with when they encounter your company for the first time. As a business, you need to respect that a candidate has taken the time to research, meet with you, and they are assessing you as well as you them. Should you never let them know why they didn’t progress, you will be leaving them with a poor image of your brand. In a world that is dominated by social media, you also risk being ‘called out’ for your crime, and if you are a repeat offender you may find others sharing your shame. Tips to do it better. The aim when giving feedback is to get people to comprehend their strengths and improve their weaknesses. Because if you keep making the same mistakes over and over again, you will never get anywhere. However, we often get calls from candidates wanting to know "Why they aren't getting anywhere in their job search"
Sometimes the truth hurts but people want to know where they stand as opposed to being led a merry dance. I am not afraid to say to someone that an employer isn't going to pay me (or any agency) a fee for someone of your background and then tell them to truth as to why. I will always try to point people in a direction where they are more likely to get a result. I have lost count how many people have thanked me and wished that other agencies had been this honest and upfront with them earlier. If you want feedback, don't argue with it! Take it on the chin, learn from it if you can and be gracious by thanking the person who is delivering it. We always ask clients and candidates for feedback at the end of each assignment, have a look at our testimonials page. 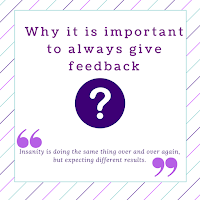 Why don’t people give feedback? Usually it is a time issue or down to the fact that no one likes to deliver bad news. People shy away from explaining to someone where they went wrong as they don’t want to cause offence. However this is the type of feedback people can really grow from. As long as it is delivered in the right way…. Don’t delay, if you are going to reject someone, do it quickly as to not build false hope. Then they can pick themselves up and move on to the next opportunity. Honesty is the best policy – wishy washy feedback like ‘we preferred someone else’ doesn’t really help anyone. Take the time to identify three things the candidate did well and three things they need to improve on – this sort of feedback can dramatically impact how they approach the next interview. Reject by phone not email – allow the person to ask questions rather than brush off with the written word. Thank them for their time – it is precious to us all. Finish on a positive – let them know what you found really good in their interview, then they can keep repeating a skill not a mistake! Leave them with a great impression of your brand – you never know what they may accomplish in the next few years. You can also follow us on Twitter and LinkedIn and 'like' our Facebook page.